USD is getting support from Draghi’s speech which asked the national government to cooperate with ECB in order to control the inflation and increase the economic growth. Today EURUSD will be affected by some economic news such as Italian Industrial Production m/m, French Industrial Production m/m, German WPI m/m, and German Final CPI m/m for EUR and Federal Budget Balance, Prelim UoM Inflation Expectations, and Prelim UoM Consumer Sentiment for USD. After hitting the 61.8 of Fibonacci retracement EURUSD started falling but it may not be the reversal pattern yet. 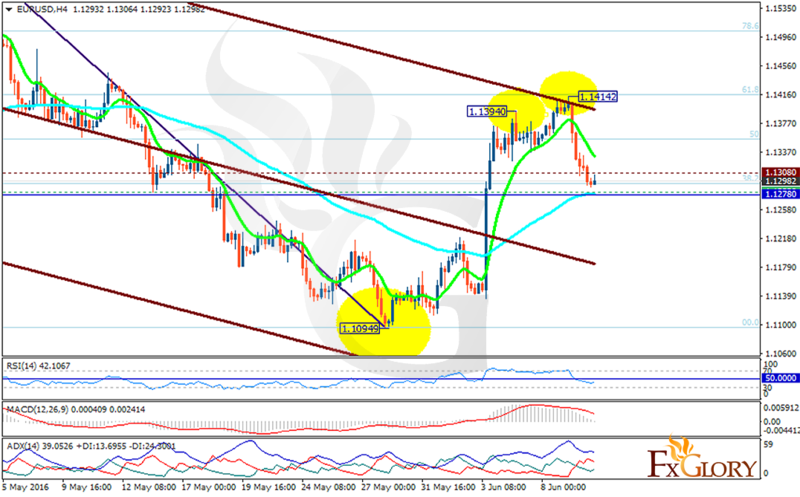 The support rests at 1.1282 with resistance at 1.1308 which both lines are above the weekly pivot point at 1.1278. The EMA of 10 which is located above the EMA of 75 has also reached its top and now is falling down as well. The RSI is staying at the neutral zone, the MACD indicator is in positive territory and the ADX is showing strong sellers. There is no clear signal for this pair at the moment. The resistance level breakout can make the pair continue its bullish trend however the support level breakthrough can be a good sign of reversal which makes the pair target 1.1200.